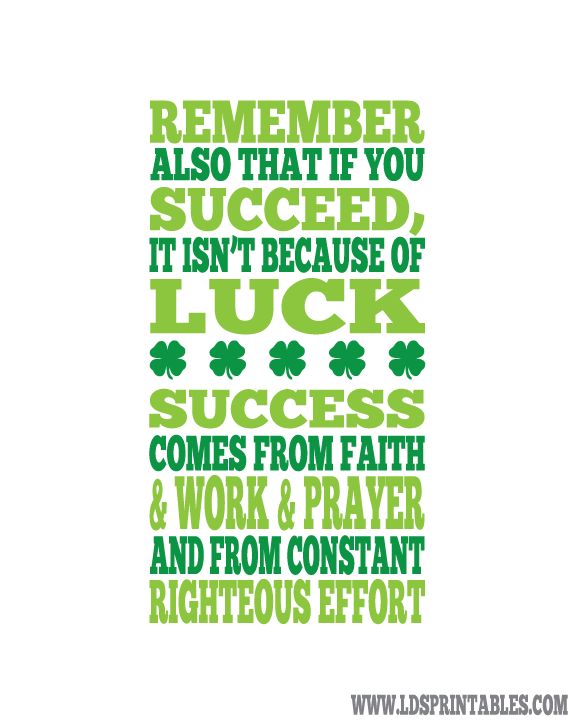 With St. Patrick’s Day just a few days away, I have been thinking a lot about luck and how to teach my children what “luck” really is. Is luck getting the right job at the right time? Is luck happening to win a raffle at a party? Is luck finding money on the ground, right when you need it? I guess each person can interpret these things in their own way, but many of them I feel are blessings that the Lord wants us to have. “Remember also that if you succeed, it isn’t because of luck. Success comes from faith and work and prayer and from constant righteous effort” (read talk here). I love that in President Kimball’s description of luck, he focuses on us consistently doing the right things. I find that the “luckiest” times of my life are the times I am striving to be consistent in gospel living, which helps me to know even more that I am being blessed for my efforts. I can teach my children to be consistent in righteousness, to pray, and to trust that God will give them what they need as they are striving to live His will. What are you doing with your family to celebrate St. Patrick’s day?